The Comet: A very good weekend in Paris! 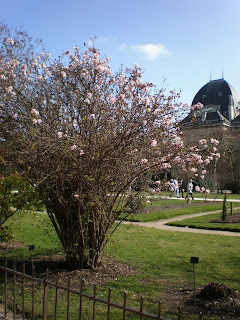 Yesterday Parismus organized a treasure hunt in Montmartre, i.e. a kind of orienteering in the city. And that was fun! Because even though I've been walking around in Montmartre already many times, there's still a lot of places I haven't seen! 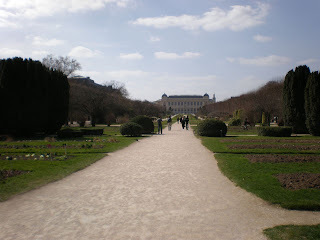 And now, along with this hunt, I walked on even some very small streets and also got a lot of new information about the quartiers and the history of Paris. Because during the hunt, we also had to find the right answers for a lot of different questions. In the evening I went to a "soirée polonais" at Marcins place and there we tasted some polish vodka. And oh, I really needed an evening like that! It just felt so good and I felt so at home there! You know, just hanging around with friends, drinking vodka, eating chips and... well, simply having a good time! We even ended up singing some drinking-songs! (poor neighbours...) :D And the shots we drank were very interesting! It was vodka with some red juice and then a few drops of tabasco. You should try it! A bit different but not bad at all! Quite the contrary actually! Even though I reached home pretty late (and survived the nightbuses in Paris, with changes and all!) I still woke up before nine this morning. Maybe because the sun was shining? Don't know... But anyway, I went out for a walk again, enjoying the sunshine and the warm spring weather. It almost felt hot when the sun warmed up my semi-dark clothes! This is the main part of the park. They had already started to bed out some flowers and I was just so happy when I saw that! First flowers this spring! :) And there was a shrub that had also already started blooming. 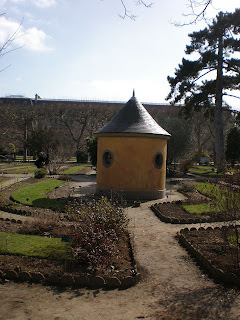 And I liked this small house very much, it looks a bit like a small Moomin-house, doesn't it?